Here are Herriman's cartoons for October 29 through November 1. Of special interest are the last three, which form sort of a three day triptych, all variations on the same scene. You might also notice a slight change in tone -- earlier cartoons gave the impression that there was no doubt that this pack of bums (and the more I read about them, they certainly were) would be history after the election. 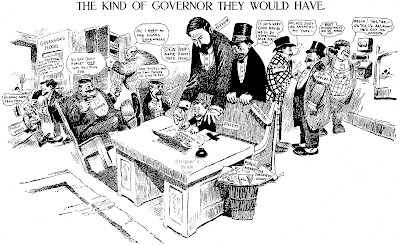 Now the tone is almost mournful as the Examiner began to realize that the Independence League candidate, Langston, was not garnering the level of support needed to win the governorship, and that either Bell or Gillett, both in the pocket of the Southern Pacific, were the more likely winners. those last three are much more interesting than anything that was happening in the comics sections at the time. 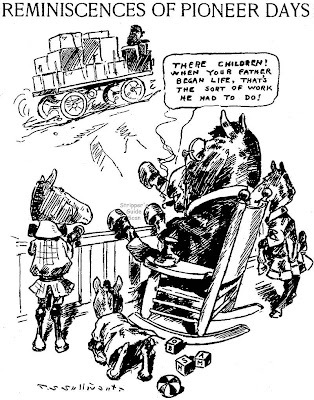 Herriman has got such a momentum going here that the characters establish their own life on the page all these years later, independently of the real persons they're caricaturing. George McManus, who looks like a walking edition of his hero, Jiggs, claims that all cartoonists tend to resemble their creations, and vice versa. Harry Hanan and "Louie" are a case in point. Though the bespectacled car­toonist bears little physical resem­blance to his bemoustached panto­mime hero, Mr. Hanan and "Louie" are definitely soulmates. Their philosophies, economic status -and weight-keep pace with each other. When "Louie" made his bow in U. S. papers five years ago this week, he was a slight young man who eked out a precarious liveli­hood as a burglar, panhandler or pickpocket. His creator was a staff artist on the The People in austere post-war England, whose income was equally precarious, if slightly more legitimate. Since that time things have been looking up for Harry Hanan and, consequently, they've been looking up for "Louie" too. The cartoon­ist and his family are settled in a model suburban home in Westfield, N. J. (they came to the U. S. in November, 1948) and, equipped with a car, a television set, etc., lead model suburban lives. Mr. Hanan has gained 12 pounds. In that time "Louie" has aban­doned his life of crime, though he still cuts corners from time to time. Readers of the daily and Sunday strips now usually find their hero in the role of henpecked family man, ignored restaurant patron or cheat­ed customer. And, though exact fig­ures are not available, he seems to have gained at least 12 pounds. Mr. Hanan, once described as a "solemn, helpless-looking" man, shares these qualities with "Louie." Yet both manage to wreak occa­sional revenge, real or fancied, on a hostile, confusing world. Mr. Hanan admits to a long-standing ambition to snip the feathers off women's hats. The 35-year old cartoonist went to art school in his native Liver­pool, and got his first job doing layouts and illustrated articles for the Liverpool Evening Express at $16 a week. Occasionally he re­ceived a $2 bonus for doing a daily cartoon. 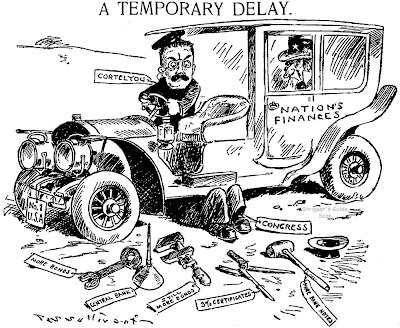 After six years of Army service in World War II, Mr. Hanan joined the staff of The People, London's four million circulation weekly, as editorial cartoonist. He started "Louie" because he found that drawing one weekly editorial cartoon didn't quite take up all his time. It was in The People that H. R. Wishengrad, head of Press Fea­tures, saw "Louie" and decided to syndicate it in the U. S. The strip defied two old taboos of the syndicate business: against panto­mime strips and against British imports. "Louie" caught on, and both taboos have since been scrapped. Today Mr. Hanan's strip ap­pears in almost 100 U. S. papers, and in more than 100 publications abroad. Some newspapers use it on their editorial pages-a unique distinction for a comic strip. "Louie" has rated high in reader­ship surveys in Oakland, Calif., New York City, and Stockholm, Sweden, among others. "Even when we're settled, 'Louie' and I tend to be shiftless," Mr. Hanan says. "People seem to like that." Well, ok, let's throw Miss Grundy a curveball. Rather than blather on about the innate power of the editorial cartoon, or citing the master, Nast, and how his toons succeeded in bringing down a government, let's keep it real. 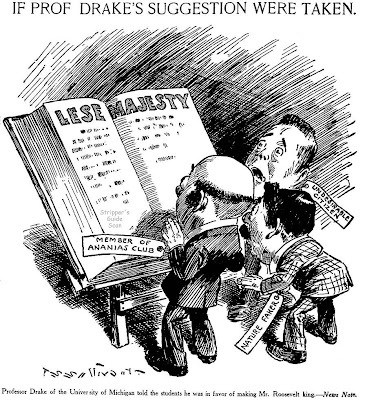 About 2% of the population reads newspaper editorials, but more like 98% will look at the editorial cartoon. Newspaper editors hate to admit it, but the best way to get across a viewpoint on a news story is with the editorial cartoon, not with some long-winded blather from the editor. 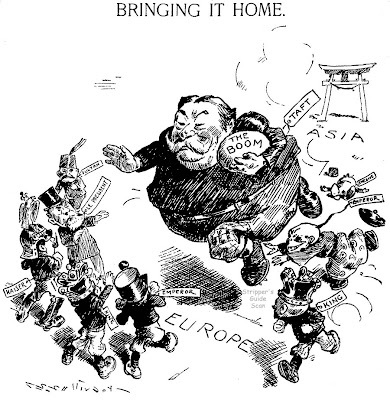 Ipso facto ergo sum the editorial cartoon is the unacknowledged king of the op-ed page. Howzat? Louie was a nice strip but never all that popular. I think such a reprint project would fall into the 'labor of love' category. Perhaps you should consider taking a whack at it. Can't get enough of Sullivant! 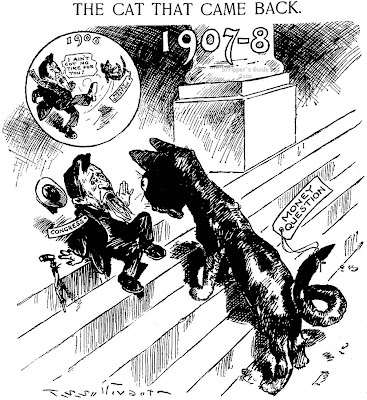 The Cat Came Back: what a great metaphor for a problem that won't go away! Couple of months ago (okay, more like four) it came up in conversation with R.C. Harvey that he'd not had the pleasure of seeing T.S. 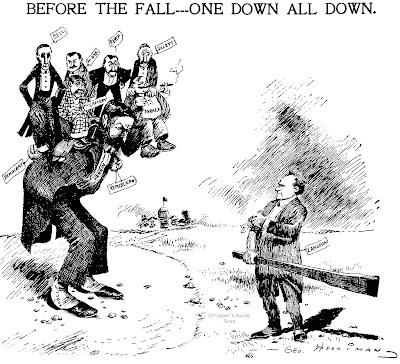 Sullivant's editorial cartooning, and I promised to dig some up for his edification. Better late than never, here's a small sampling. 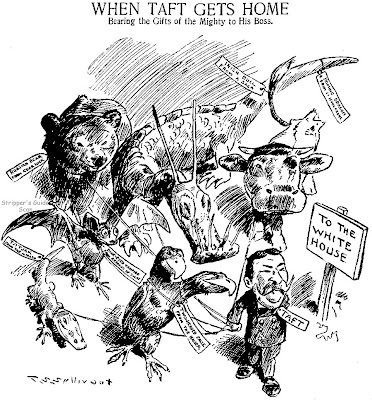 Sullivant, well known for his delightful animal caricatures, isn't remembered for his editorial work for Hearst, probably because he was sort of a flop in that role. 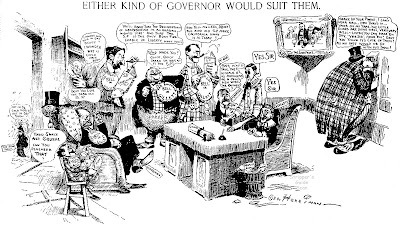 The drawings, of course, are top-notch, but Sullivant apparently wasn't much interested in politics as most of them are on the tepid side. 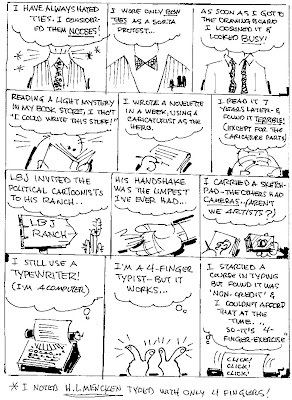 Here's a local strip from the Spokane Spokesman-Review that ran daily from March 16 until at least July 18 1981. 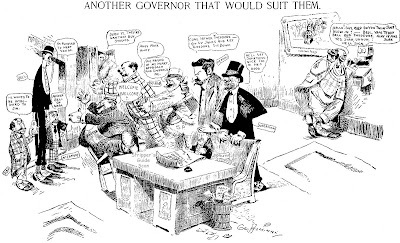 Spokania commented on Spokane politics in the guise of a fairy tale. Sort of a local version of Pogo, you could say. I know nothing of the creator, R.E. Wells, other than that he or she did a fine job. Searching for local strips is like looking for needles in haystacks, and finds such as this are always a delight to me. If you have information and samples of local strips I'd love to hear from you. When I stayed in Pennsylvania last Spring, the local paper, Tribune-Democrat (Johnstown, PA), was running a comic panel called "Bol's Eye" by Shaun Boland in the Editorial section. I looked around and it's apparently a weekly comic panel that the creator self-syndicates to over 27 publications, most of them in Pennsylvania. He's got a pretty decent little list of papers! Me again ... here's some trivia probably interesting only to me. "Bol's Eye" just became the 6,666th feature to get a listing in the Stripper's Guide index.